We may put celebrities on a pedestal, but when it comes down to it they are really just like us. Sports fandom often shows how even the most famous celebs – actors, musicians, politicians and even fellow athletes – love going to games, rocking their favorite player’s jersey and arguing about why their team is better than their friends’. Whether it’s rooting for their hometown, their hubby or their home-away-from-home, these celebrities show their squads some love from close-up courtside to way up in the box seats. “We The North” is Canada’s NBA rallying cry. The Raptors’ slogan is catchy, but Toronto could just as easily switch it out for “Started from the bottom now we here.” Considering the Raps’ success since 2013, Drake’s jam is already unofficially their official anthem. 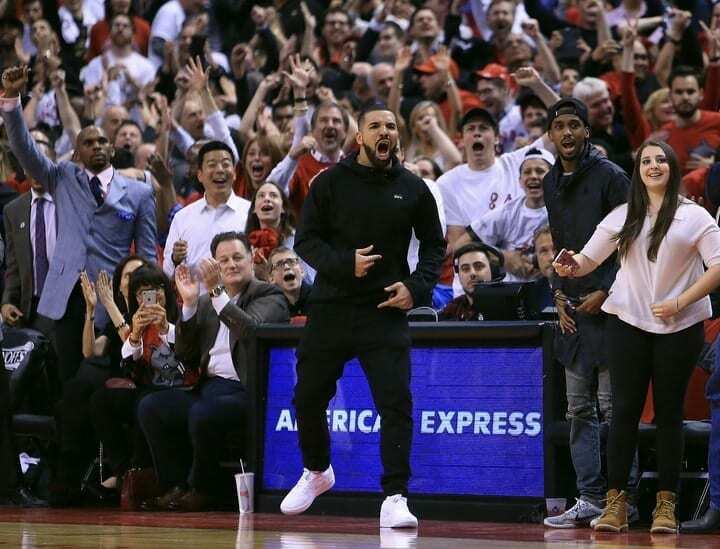 Drake, a Toronto native, is one of the most notable celebrity fans in the NBA and has no trouble asserting himself as one of the most outspoken superfans at every Raptors home game. Toronto’s homegrown rapper has developed such a close relationship with the Raps that he even has his own annual “Drake Night” game day giveaway. Steph Curry, aka Threezus, has been the savior of Bay Area basketball since the Golden State Warriors selected the superstar point guard in the 2009 NBA Draft. The sharpshooting baby-faced assassin is willing to sacrifice everything on the court in Oakland, but the moment he steps off the court, his allegiances lie elsewhere. 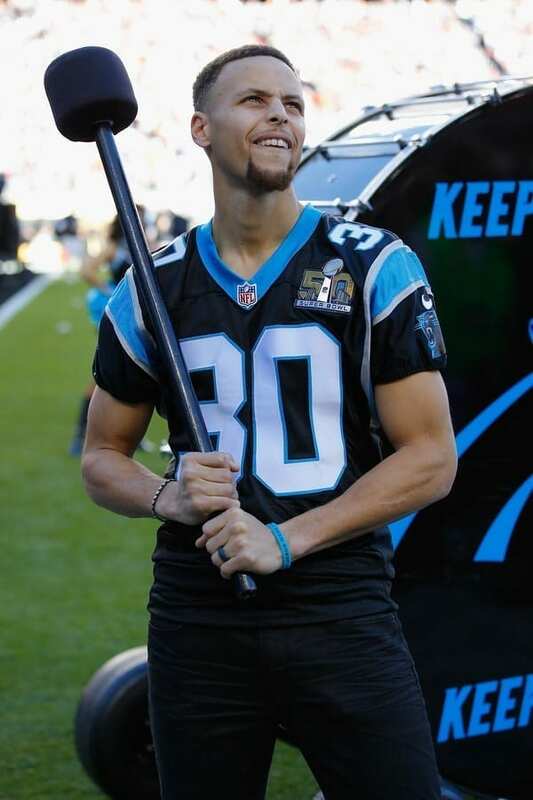 Curry is a faithful Carolina Panthers fan, as he spent much of his childhood in Charlotte, N.C., where his father, Dell Curry, was hooping for the Charlotte Hornets. You can take the fan out of the city, but you can never take the city out of the fan. You know what it is… Black and yellow, black and yellow. Everything he does, he does it big. If you don’t know what it is, this jam that’s garnered almost 300 million views is a song by rapper Wiz Khalifa that’s transcended into the Pittsburgh Steelers’ unofficial anthem. Wiz grew up a military brat before settling down in Pittsburgh. 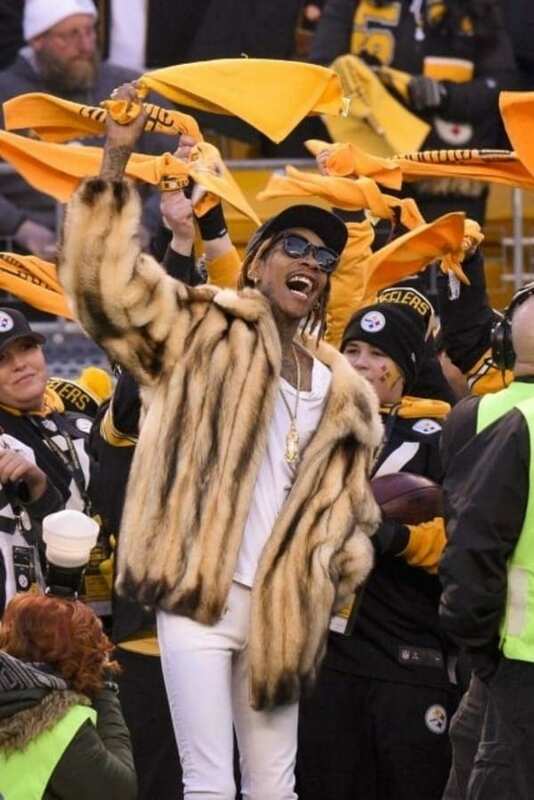 Since “Black and Yellow” dropped in 2009, countless fans have tried to remix the hit, but there can only one masterpiece worthy of a Terrible Towel wave. The song reached it’s sports zenith at Super Bowl XLV in 2011, when the Steelers adopted it as its official fight song. 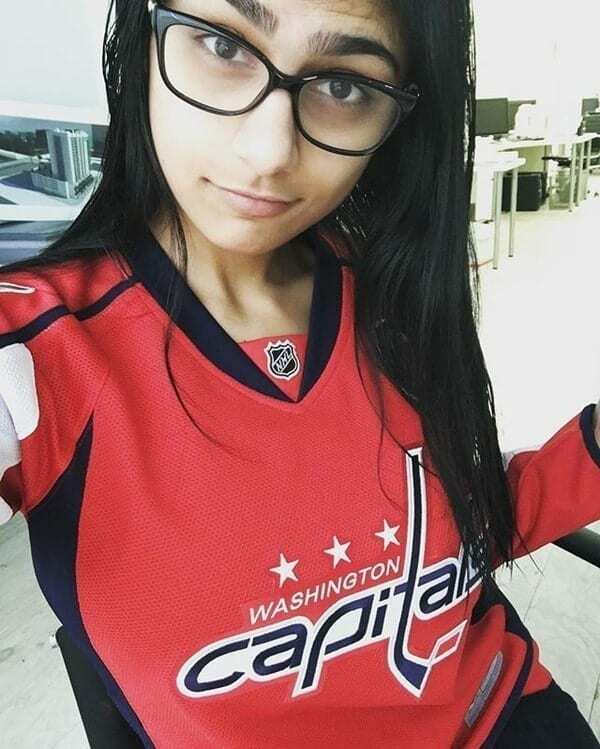 When it comes to controversial celebrities, Mia Khalifa certainly deserves her place on its Mount Rushmore. Khalifa – who was the No. 1-ranked actress on the internet’s No. 1-ranked websit — of the adult nature — moved from Lebanon to Maryland at a young age and quickly grew obsessed with D.C.-area sports teams. Khalifa is unapologetically outspoken in her love for all teams repping the DMV and rooting for all her local teams. She is one of the more prominent celebrity fans of the NHL and her Washington Capitals. Though her time on the show was brief, Khalifa also hosted a sports show, Out of Bounds, for Complex News, alongside former Washington Wizards All-Star point guard Gilbert Arenas. 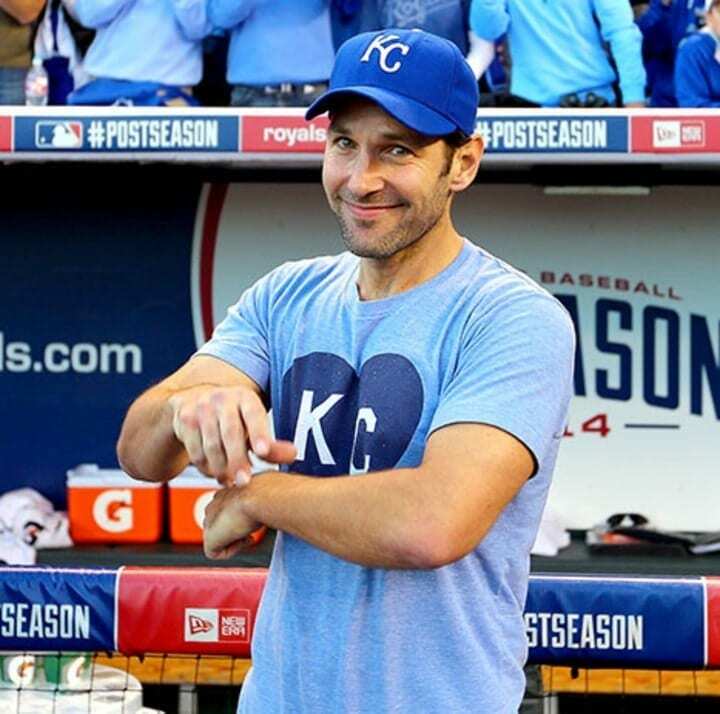 At the age of 10, comedic actor Paul Rudd and his family moved to Lenexa, Kansas. The far-eastern Kansas town’s proximity to Kansas City, Mo., set Rudd up for a lifetime of rooting for all things Kansas City in sports, both Royals and Chiefs. Rudd is not playing games when showing off his fandom for his Royals. He’s revealed his obsession in various ways from appearing on MLB Network to talking about his over-the-top superstitions like wearing the same Royals shirt at every game for over a season leading up to their 2015 World Series championship. Wow, the Kardashians sure do love NBA basketball. Even though the Kardashian crew hails out of Los Angeles County, they’re more about rooting on individuals than supporting their local teams. 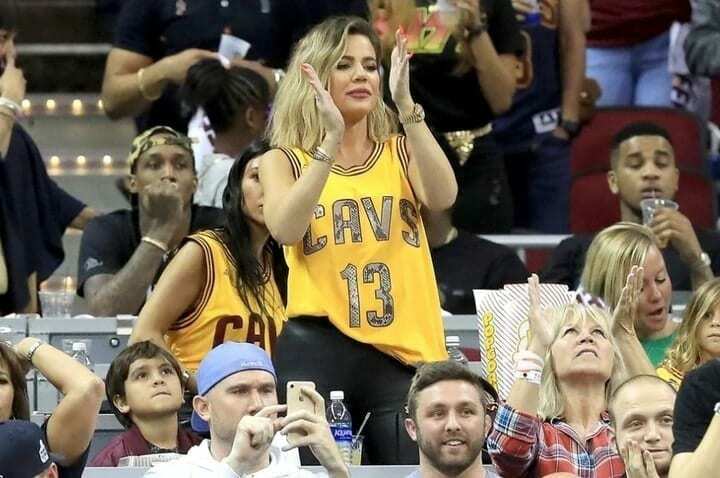 While Khloe K. was all about the Lake Show while married to former Laker Lamar Odom, her allegiance now lies in The Land. Since 2016, Khloe has dated Cleveland Cavaliers center/forward Tristan Thompson, bringing some serious star power to The Q whenever the Cavs are in town. From the championship-winning Odom to NBA Finals constant Thompson, she sure knows a winning power forward/center when she sees one. Being in the public eye on a nearly 24/7 basis, the Royal Family has to keep an all-inclusive air about them to truly embrace people from all ends of the United Kingdom and beyond. There are plenty of occasions when maintaining a relatively objective and “neutral” opinion on particular subjects are put to the test, and that goes double for sports fandom. 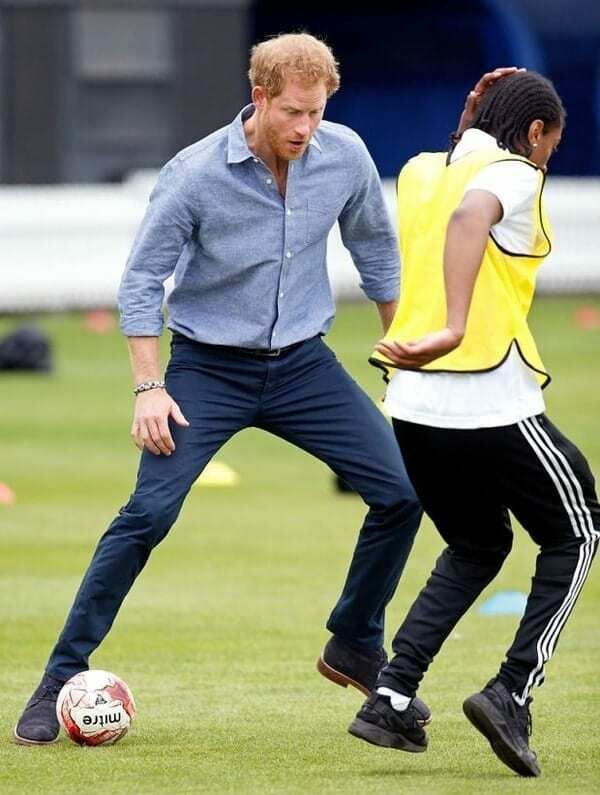 Whether Prince Harry is telling the full truth or putting words into the Queen’s mouth, he gets some major points for putting in a good word for his Gunners. Bradley Cooper hit the jackpot for more than one reason when he landed a starring role alongside Jennifer Lawrence in Silver Linings Playbook. Not did the romantic comedy-drama win an array of awards, Cooper was actually born and raised in the film’s setting – Philadelphia. 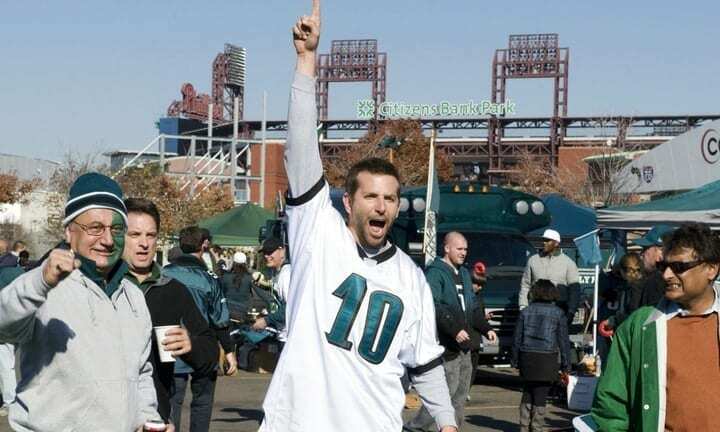 Cooper didn’t need to brush up on his acting chops for his character, a die-hard Eagles fan, because he had already prepped his entire life growing up a Philly fanatic. When the Eagles took down the Patriots in January 2018 to win Super Bowl LII in Minneapolis, Cooper was right next to owner Jeff Lurie, going wild. 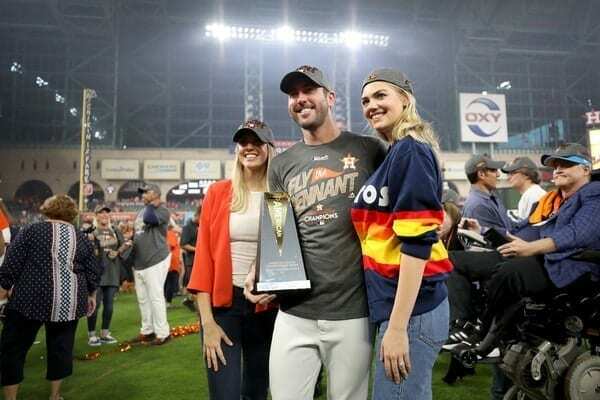 Kate Upton has been on the cover of Sports Illustrated’s Swimsuit Issue a number of times, but while it may not be a page-turner in the same way, her husband, Houston Astros’ pitcher Justin Verlander, has made his share of appearances on the front, too. It’s hard to hate on Upton for switching allegiances when she went from flaunting Detroit Tigers threads to Astros gear. She’s just rooting her hubby on every time he takes the mound. And as far becoming a ‘Stros fan in 2017, Upton didn’t have to wait long to see her husband hoist the World Series championship trophy, as he helped lead his team to the title the same season. H-Town is like a breeding ground for rap and hip-hop stars. Standing atop the city’s pool of musical talent is Travis Scott. Scott’s celebrity has risen through the ranks to become a household name, as seemingly every artist tries to work a collaboration with him. But a packed schedule doesn’t stop Scott from rooting for his home squad. 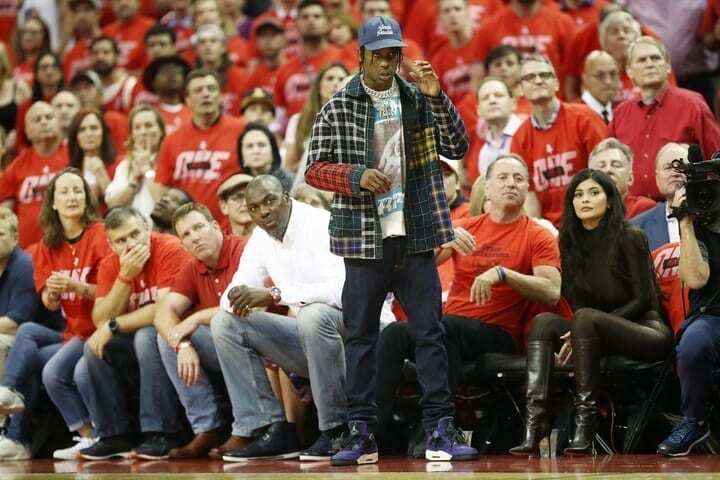 Scott is an avid Rockets fan and can regularly be seen clapping it up for The Beard & Co. from his courtside seats. Since Scott began dating Kylie Jenner in 2017, we’ve also had another member of the Kardashian Krew working the NBA spotlight. If there were 25 hours in a day, it seems like LeBron James would find a way to dedicate 26 hours to basketball. Even though it appears, by all measures, that King James eats, breathes and sleeps basketball, it turns out he’s got time for other sports, too. In 2011, James purchased a minority stake in the English Premier League’s Liverpool FC. 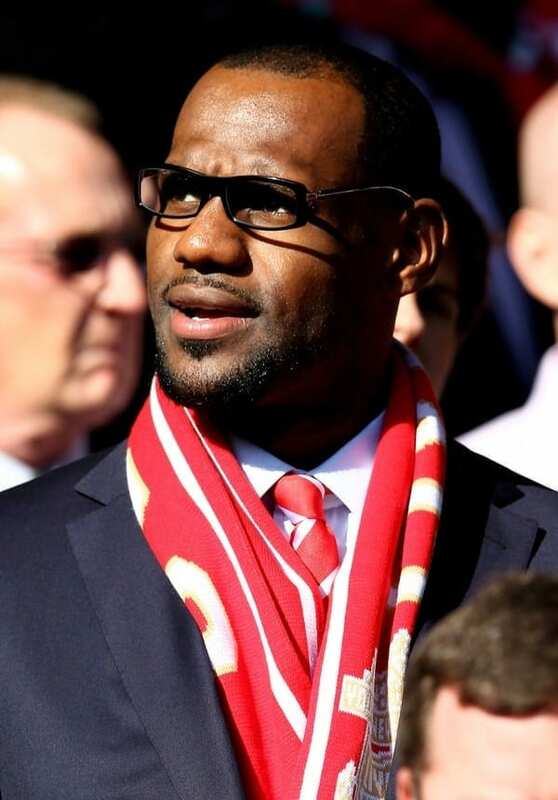 Since getting in on a piece of the action, it’s hard to imagine Liverpool doing anything wrong in Bron Bron’s eyes, considering his initial 2% stake has leapt from a reported $6.5 million to an estimated $32 million (2018). 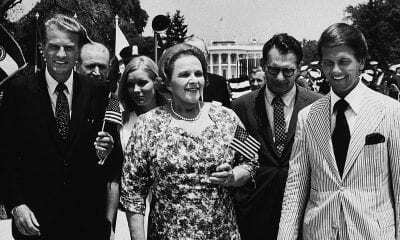 Talk about the mother of all power couples. 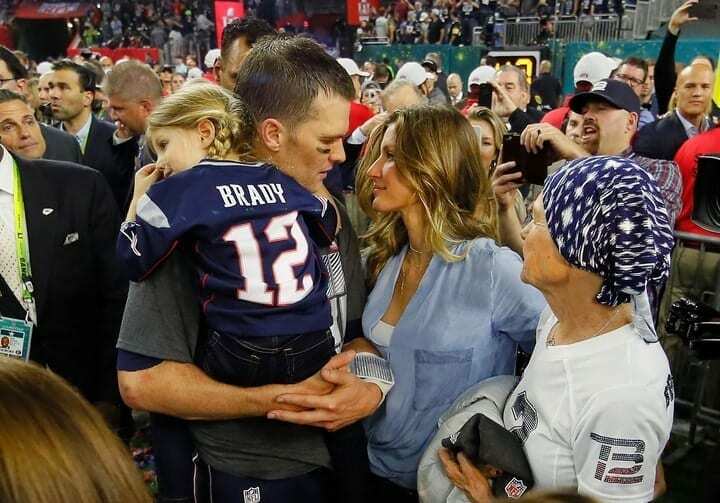 Brazilian supermodel Gisele Bundchen – who went from a Victoria’s Secret Angel to one of the richest, most powerful figures in the fashion industry – also happens to be married to arguably the greatest NFL quarterback of all time, Tom Brady. Bundchen has never shied away from rooting on her man’s New England Patriots. Bundchen can often be seen up in the boxing pumping her fist and shouting from kickoff to the final whistle. When it comes to passion, Bundchen shows enough for all of Foxboro. 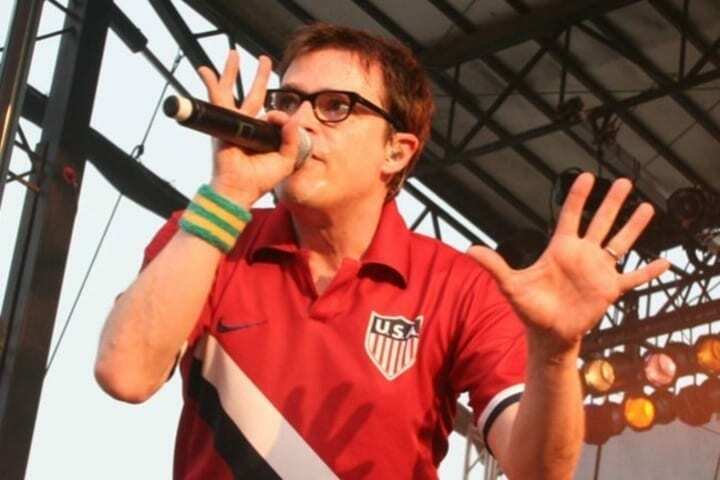 Weezer lead singer and guitarist Rivers Cuomo has been pumping out alternative and pop-rock hits since the ‘90s, and he’s shown no signs of slowing down. While Cuomo hails out of the east coast, his music has rooted him in Los Angeles, where he has proven a dedicated LA Galaxy fan. By no means is Cuomo a casual soccer fan. He’s traveled to numerous World Cups and has shown some serious love for his favorite player, Landon Donovan. Of course, rooting for the greatest player in MLS history on your team doesn’t make being a fan the hardest thing in the world. 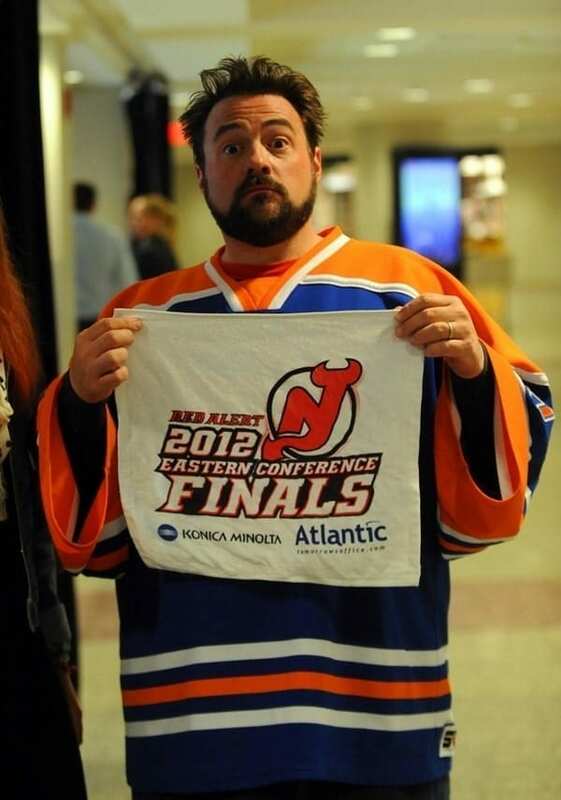 As cringeworthy as it may be, there’s something admirable about legendary filmmaker Kevin Smith’s unrequited love for the New Jersey Devils AND the Edmonton Oilers. Two teams?! At least the Devils are in the Eastern Conference and Oilers the West, right? To be fair, Smith has grown to simply consider himself “a hockey fan” first, though it’s certainly still a hard pill to swallow for many. Smith grew up in New Jersey and seemed to transition to a western loyalty as he established new roots in Hollywood. Zooey Deschanel does it all, starring on sitcoms like New Girl to silver screen classics like Elf and 500 Days of Summer while somehow finding time to enjoy a career as a Grammy-nominated singer-songwriter. Rather than sleep like a normal human being, Deschanel spends her spare time rooting for the San Francisco Giants. That seems a bit crazy since Deschanel is an LA native, but her ties to the team make it seem like she’s spent her entire life in the Bay Area. Deschanel went the distance in the Giants’ 2010 World Series run, attending every postseason game and even sang the national anthem during the team’s historic journey. Actor and comedian Rob Riggle is equal parts hilarious and intense, which somehow fuses to make just about anything he says or does pure entertainment. Riggle’s unmistakable booming voice sure comes in handy when rooting for his favorite football team, the Kansas City Chiefs. 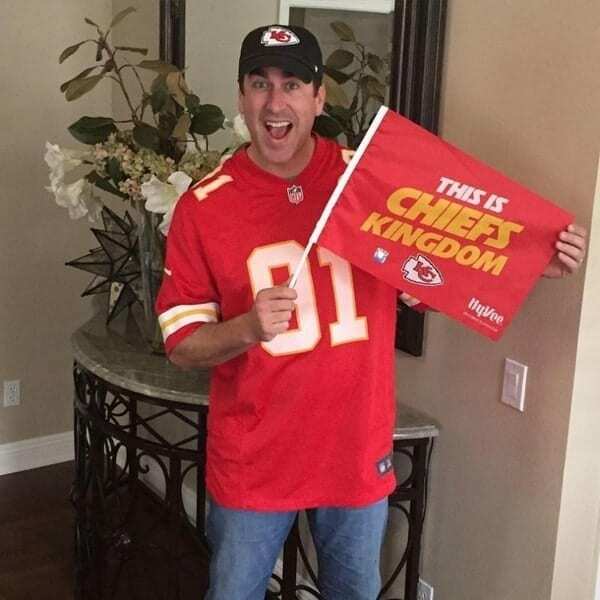 The Chiefs have long had a reputation for holding down one of the loudest, liveliest stadiums in the NFL and Riggle fits the bill to a T.
Riggle’s Chiefs obsession is so well documented that he would even recorded a bunch of NFL comedy sketches at Arrowhead Stadium for the games. If there is one celebrity whose entire city can unanimously agree best reps their teams, it’s Boston’s own, Mark Wahlberg. 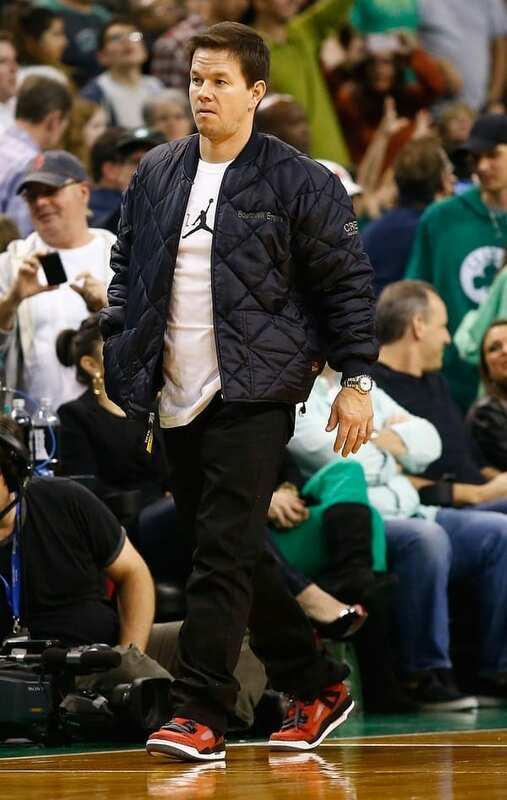 From his younger days when we knew him as Marky Mark to his Hollywood icon status today, Wahlberg (and his brother, Donnie) have been a constant at Boston sporting events. While he’s most likely to be spotted at a Patriots or Celtics game, it’s at the TD Garden where his presence is a staple. LA has Jack, NYC’s got Spike, Boston’s got Wahlberg. And as far fans who can also ball out, Wahlberg isn’t afraid to handle the rock. 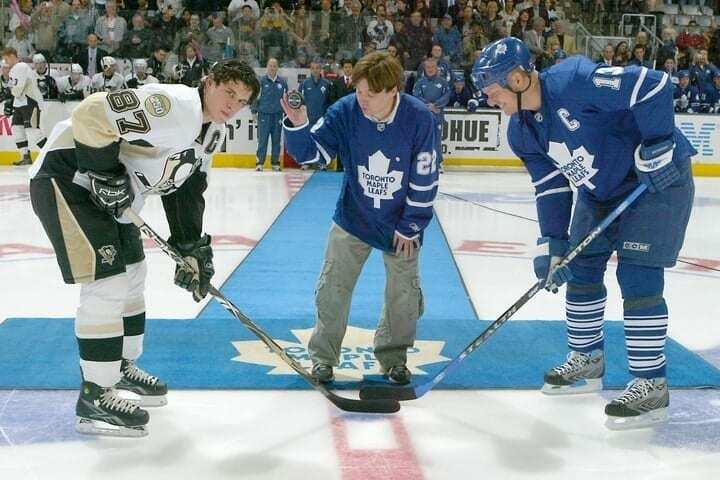 It wasn’t a coincidence that Saturday Night Live legend Mike Myers made Wayne and Garth, from his famous Wayne’s World sketches and films, be avid hockey fans. Myers grew up in Canada. ‘Nuff said. Growing up in Scarborough, Toronto, Myers was essentially born into rooting for the Toronto Maple Leafs. Myers is such a die-hard fan that he even snuck some shout-outs in his first Austin Powers film, naming two characters Commander Gilmour and General Borschevsky after then-Maple Leafs players Doug Gilmour and Nikolai Borschevsky. Myers’ also made a favorite old-school player of his, Stan Mikita, into the name of the donut shop in Wayne’s World. There is a whole laundry list of superstar celebrities in New York City who regularly reveal themselves as basketball, baseball and football fans. Of course, many of those MLB fans stick to the sure thing and root for the Yankees. 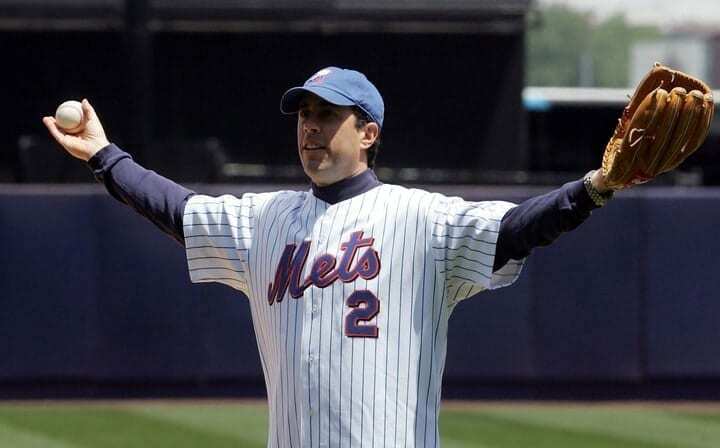 As he often tends to do, Jerry Seinfeld took his own path in following the Mets. Since Seinfeld is, well, Seinfeld, he does a ton of cool stuff involving the team like calling into a sports show on WFAN-AM to talk shop. Seinfeld didn’t just call in to sports talk radio to give his piece of mind, he even called a few innings back in 2010 on SportsNet New York! Detroit has some of music’s biggest bad boys repping Motor City’s squads like Eminem and Kid Rock, but it’s one of our favorite Bad Moms, Kristen Bell, who reps Hockeytown’s Frozen team (okay, no more puns). Seriously though, Bell is one die-hard Detroit Red Wings fan. Growing up in a Detroit suburb, Bell was a hockey fanatic and a tough one at that. How tough? As a teenager, Bell was playing street hockey when she broke both wrists. Sacrificing the body for the game, now that is what real method acting (and fandom) looks like. Trey Parker and Matt Stone, the creators of South Park, are two of the most animated NFL fans in the nation. Terrible puns aside, the Colorado natives took their love for their Denver Broncos to a whole new level. Parker and Stone have cracked jokes at the Broncos’ expense on countless occasions and never miss an opportunity to reference the team whenever possible. The only thing that Parker and Stone seem to possibly enjoy more than inserting the Broncos into South Park is finding a way to trash the Patriots. That’s something that just about every fan outside New England can support. Comedic genius Bill Murray is a fan of, and has stake in, a LOT of baseball teams. Seriously, the man has dumped money into so many different minor league teams he could have put together his own division. That being said, Murray grew up in Evanston, Ill., just a few miles north of Chicago. So, as much stake as he has in teams across the nation, his heart belongs to the Chicago Cubs. Any time Murray is in the stands (and we do mean right there in the stands with us normies) at Wrigley Field, you can bet he’ll deliver an unforgettable moment in some fashion. 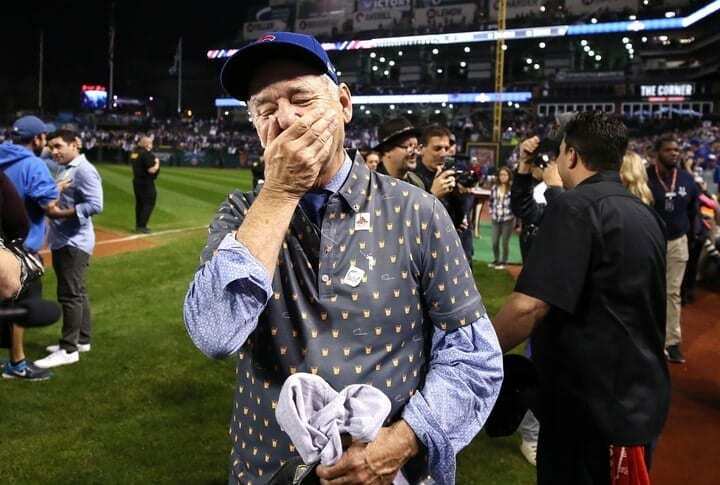 Murray was seen leading Wrigley in “Take Me Out to the Ballgame” and celebrating in the clubhouse when the Cubbies finally ended their 108-year World Series championship drought in 2016. Bill Murray brings some heavy-hitting celebrity stardom to the Chicago Cubs, but the Chicago White Sox have some next-level influence in the 44th POTUS, Barack Obama. Obama spent many years living in Chicago, working as a community organizer in the South Side from the mid to late ‘80s before attending and eventually teaching at University of Chicago Law School. Obama is a real-deal sports fan, as he was often shown spending his Presidential downtime shooting hoops. 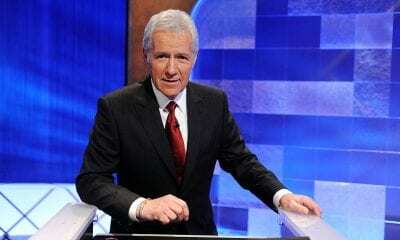 He also took great pride in making his men’s and women’s NCAA Tournament basketball pool picks for ESPN. 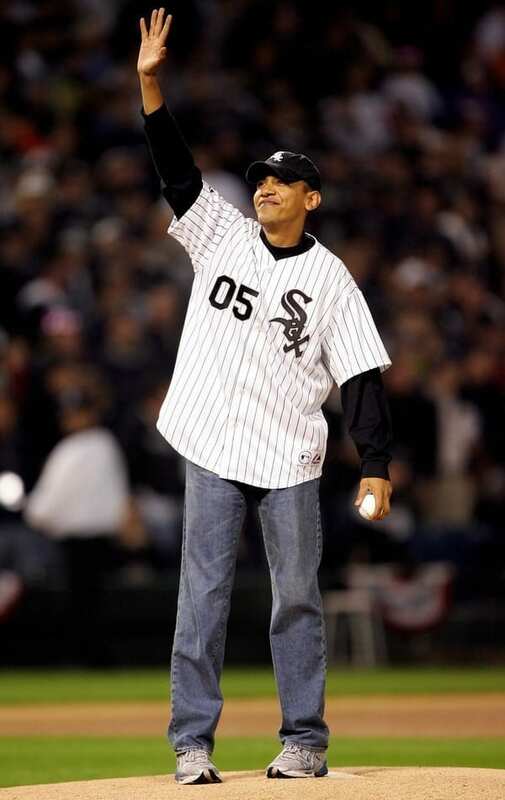 But for him to support Chi-Town’s “other” baseball team (sorry, Sox) is a breath of fresh air to the scorned White Sox. With the storied Lakers’ grip tightly clamped around Los Angeles as the city’s top team, the Clippers have needed all the love they can get to earn their way into the hearts of fans. Enter Hollywood hero Billy Crystal. The comedy actor/producer proved he loves laughs by switching allegiances from the dominant Lake Show to the lowly Clippers when they first came up from San Diego. While the disastrous franchise was a black hole for success for the vast majority of its first two decades in LA, the team and fans’ camaraderie throughout the struggles is exactly what intoxicated Crystal with rooting for the city’s underdog. For those unfamiliar with Drew Carey outside of hosting Whose Line Is It Anyway? and The Price is Right, look no further than the intro of The Drew Carey Show to see where his sports allegiance lies. Carey was born and raised in Cleveland, Ohio, and has been an avid supporter of all the city’s teams growing up. While Carey has been seen supporting all of the city’s sports, the Indians have shown how much his support has meant to them. 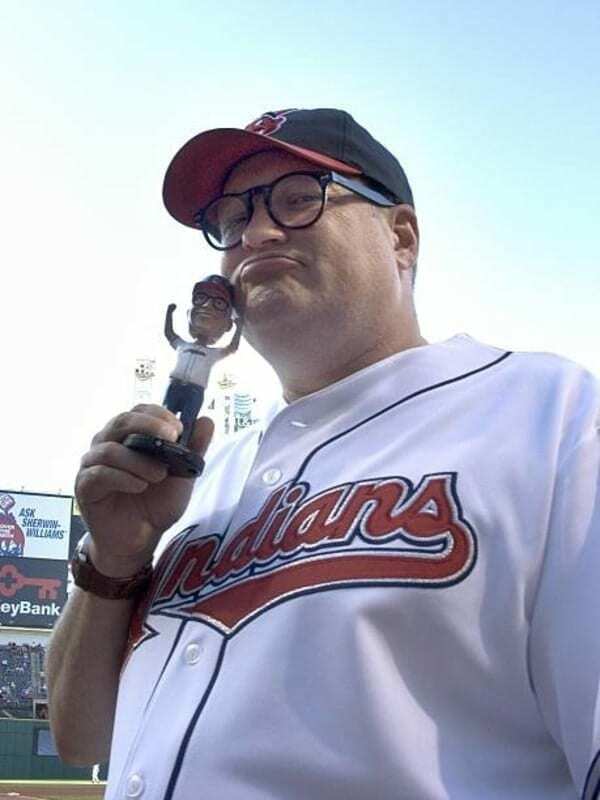 Carey threw out the first pitch against the Royals in 2006 and was honored for being the “the greatest Indians fan alive” with his own bobblehead. Born and raised in Seattle, Grammy award-winning artist Macklemore has always been more than eager to flaunt his fandom in any way possible. 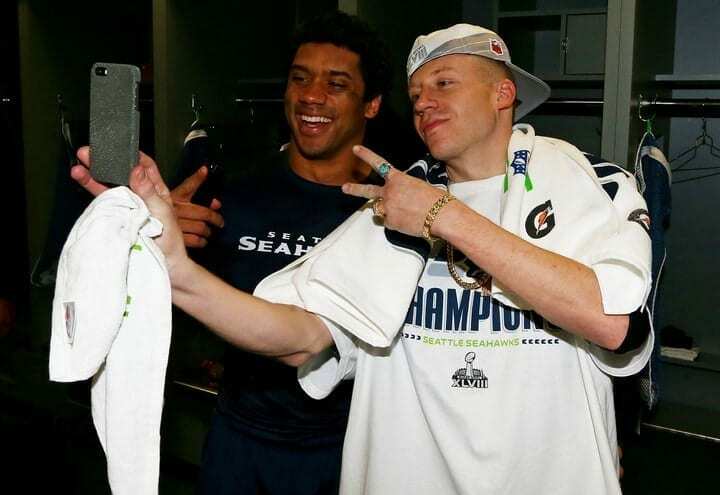 Macklemore is all about all things Seattle, but there no doubt that his Seahawks always come first on that list. Not only was Macklemore in attendance for the Seahawks’ 2014 Super Bowl victory, he performed at halftime for the NFC Championship game. Macklemore’s music has a larger presence than that, as his song, “Can’t Hold Us,” was played after every Seahawks touchdown at home. 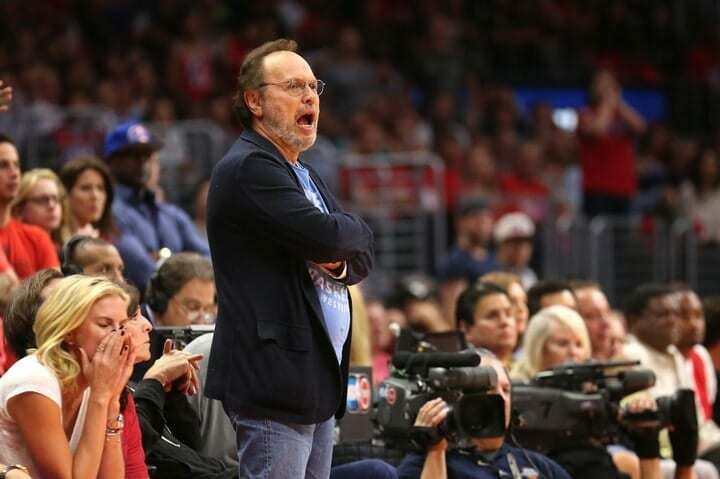 Billy Crystal is the celebrity face of the Clippers, but Hollywood icon Jack Nicholson’s Lakers obsession has elevated him to the status of Los Angeles’ sports superfan. Nicholson is the staple that holds the Staples Center together. 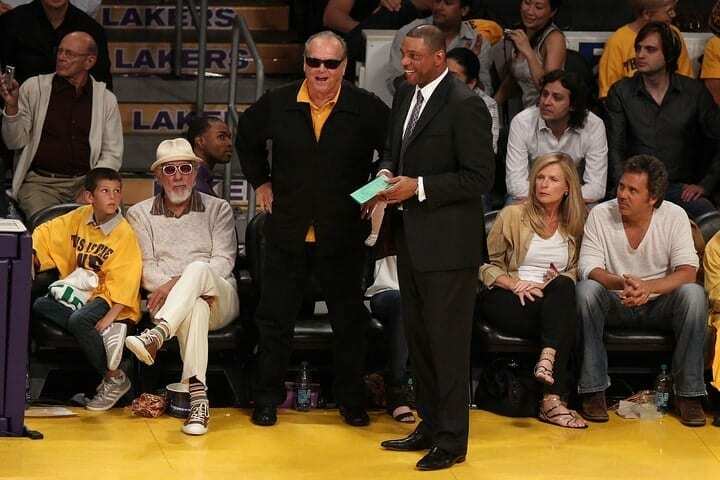 His courtside presence has, over the decades, been as entertaining as the actual Lakers games. As with everything Nicholson does, the countless stories of his antics – both on and off the court – could be made into a book. From the host of superstar celebrities that join him courtside to the endless stories from players and fans, the man deserves a statue watching the other statues outside Staples. 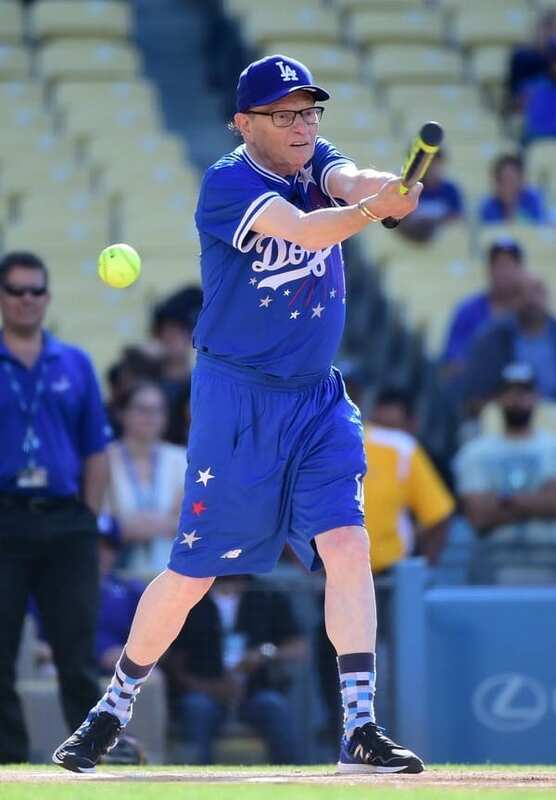 Longtime television host Larry King has been a Los Angeles Dodgers fan for a lifetime. The Brooklyn-born celeb has been rooting for the Dodgers, well, since they were Brooklyn Dodgers. From NYC to LA, King has remained loyal to his beloved Dodgers. Celebrities are a dime a dozen at LA Dodgers games, though no face is more prominently displayed than King’s, as he made sure to score the best view in baseball with season tickets right behind home plate. His obsession is so serious, he actually rearranged his entire work schedule to ensure he was done recording Larry King Now and PoliticKing in time to attend every game of the Dodgers-Astros 2017 World Series. Ice Cube’s feelings for his first love, the Raiders, are as strong as ever, even when they packed up and left Los Angeles in 1995. In the early ‘90s, Ice Cube’s N.W.A. and the Los Angeles Raiders were synonymous. The “us against the world” attitudes of N.W.A. perfectly reflected Raider Nation and the tumultuous times LA was experiencing. 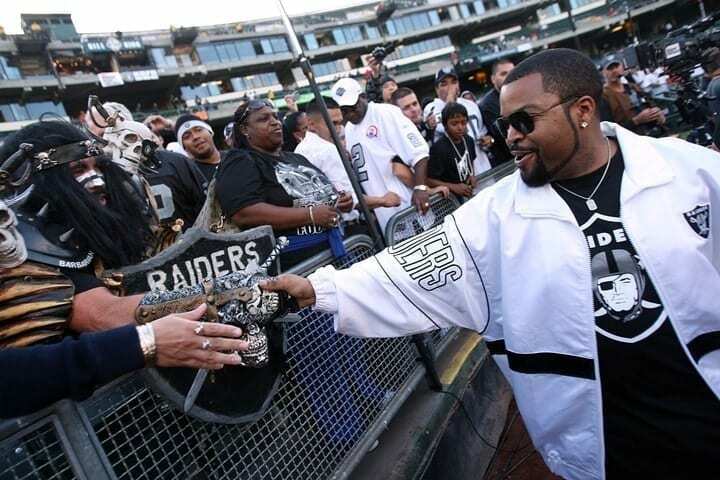 Cube’s group was so influential on the team and city at the time, he directed an ESPN 30 for 30 film, Straight Outta L.A., depicting the rise of gangster rap and the impact the Raiders had on him and the city. Even during the darkest times, the Black Hole shines. 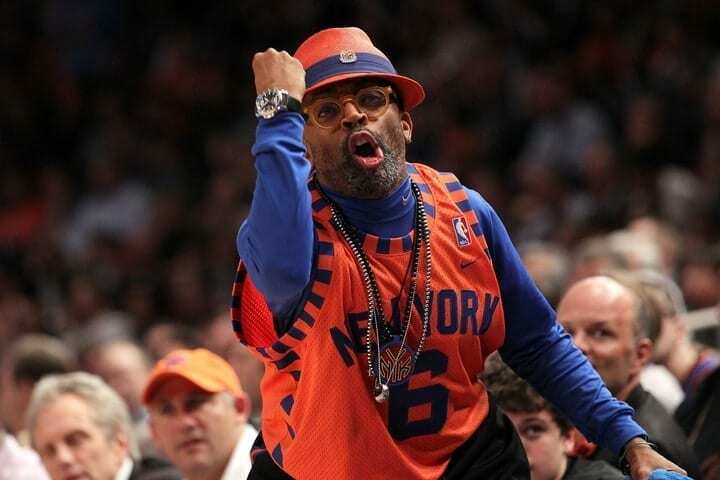 What would a list of celebrity sports fans be without the one, the only, Spike Lee. The only thing New York’s legendary film writer/producer/director/everything goes more all-in on than his productions is his New York Knicks obsession. If Spike isn’t at Madison Square Garden when the Knicks are in town, someone needs to call the cops because something is seriously wrong. Spike has been a fixture in MSG for as long as he’s been making movies, and boy oh boy is his passion as animated as ever. The man who can likely take credit as the first sports fan to develop a legit rivalry with a player (Reggie Miller) will just as likely be barking at opposing teams for another half-century… and we couldn’t love it more.